This course has been specially designed for rescue personnel, coast guards and other sea watch personnel. Rule: Deal with the shark before attending the victim*. Reason: A shark’s curiosity over the victim might still be increased, even if it did not bite a second time. Any attempt to rescue the victim can trigger another response from the shark, and the rescuer’s initial task is to secure the situation. *It is understood that a person might be drowning and immediate help is needed but most bites are less severe, hence such is rather the exception to the rule. In these rather rare occasions, a rescuer must deal with a victim while keep facing the shark. Rule: Is a shark still swimming in closest vicinity to the victim during a rescue attempt, avoid anything that might trigger competing over the victim. Reason: Despite that a shark does not see anything eatable in a person it just bit, there is the possibility that the sudden appearance of another person—together with the attempt to remove the victim—might trigger a “claim response.” A claim response could reflect an establishing of ownership based on initial appearance and exploration; hence a rescue attempt should not commence until the situation with a shark is under control. In its worst form, a claim response ends up in a tug-of-war between the rescuer and the shark with the victim in between. Rule: Approach a victim from behind and then first evaluate the situation. Reason: A stressed victim can grab you and pull you down, adding problems to the task ahead. If grabbed by a victim, submerge and move away. Rule: Move in front of the victim should a shark approach again. 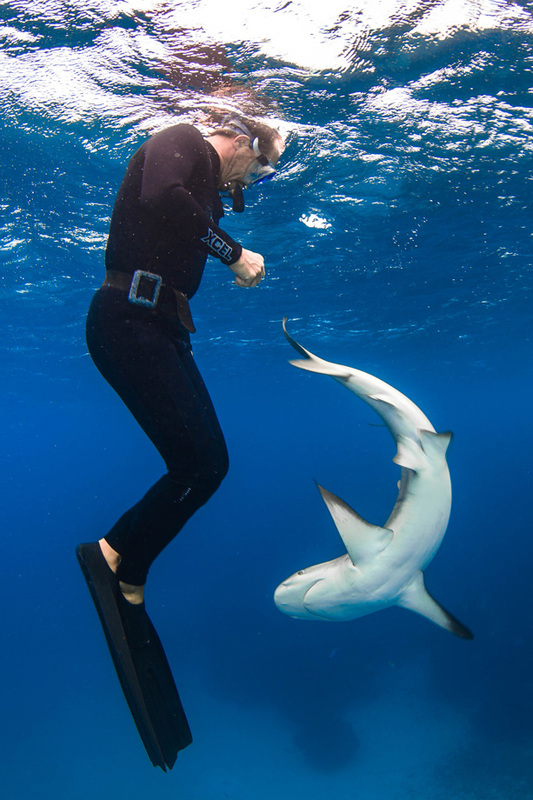 Reason: The attempt of biting a victim for a second time is statistically more than just minimal (except e.g., if a claim response is triggered), but a rescuer must still be capable of fending off the approaching shark hence must position himself/herself in front of the victim (in relation to the shark’s position), and follow the interception and confrontation rules. 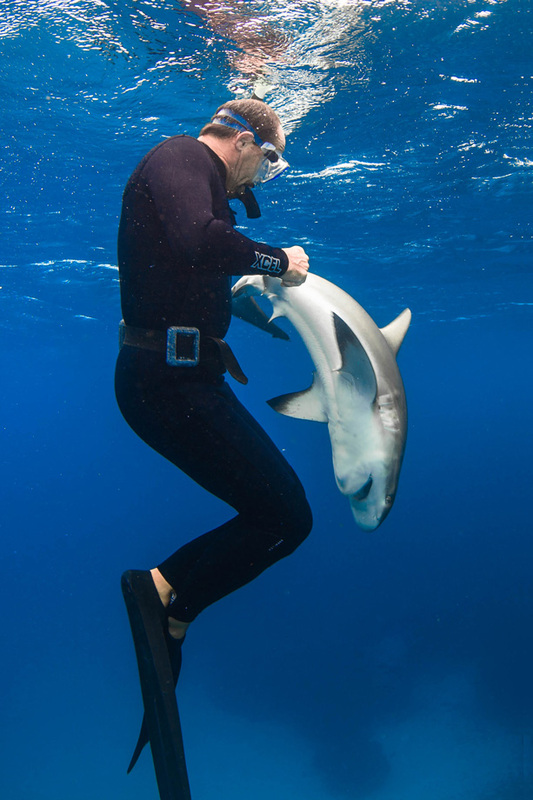 Although moving a victim from the site can trigger a competitive behavior in a shark, a situation will not escalate as long as the rescuer remains focused and immediately ceases moving the victim when the shark is turning towards the rescuer/victim again (see following rules as well). Rule: Never move a victim when a shark is approaching. Reason: Always assume that a shark is still interested in a victim, and the removing of the person while the animal comes closer could increase its interest again, and even trigger a claim response. Any moving of the victim should only be commenced when a shark is swimming away from rescuer/victim or at least swims at a distance that is larger than just a the shark's inner circle. Rule: Always push the shark off, never pull the victim away. Reason: Pushing the shark off (aim for the gills if possible) will not just be a stronger signal to the shark but it is also much easier than moving a possibly large and immobile victim. Should a further conflict not be preventable, a rescuer must always focus on the shark first (and follow interception and confrontation rules).